Dr. Santosh J. Gharpure graduated with an M.Sc. degree in 1996, from Indian Institute of Technology Bombay, Powai. He obtained Ph.D. from Indian Institute of Science, Bangalore working with Late Prof. A. Srikrishna in 2001. He held a post-doctoral position with Prof. P. Andrew Evans at Indiana University, Bloomington, U.S.A. Subsequently; he joined the Department of Chemistry, IIT Madras, Chennai in the year 2004. 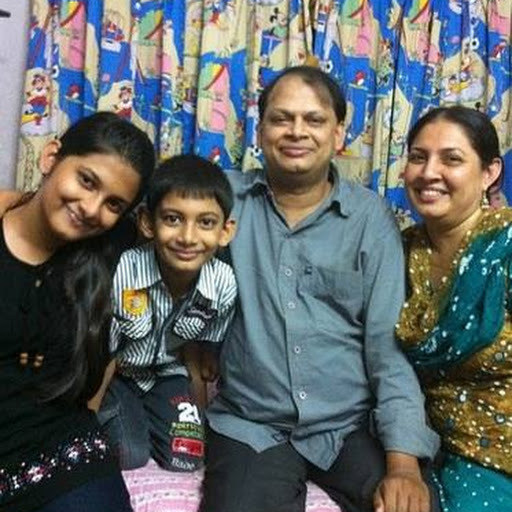 In 2012, he moved to Department of Chemistry, IIT Bombay, Powai, Mumbai as an associate professor. His research focuses on organic chemistry pertaining to natural and unnatural product synthesis and developing new synthetic methodologies. Dr. Gharpure is a recipient of INSA Medal for Young Scientist. He was awarded IIT Madras Young Faculty Recognition Award (YFRA) for his contribution in teaching and research in 2010. He received B. M. Birla science Prize in Chemistry for the year 2011. Recently, he was selected as one of the Thieme Chemistry Journal Awardees for the year 2013. KET's V. G. Vaze Alumni Achievers Award, January 2013. Selection as one of the Thieme Chemistry Journal Awardees 2013, December 2012. B.M. 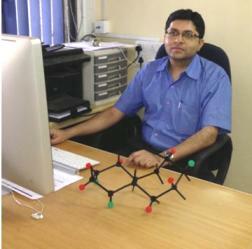 Birla Science Prize in Chemistry, November 2012. Awarded Young Faculty Recognition Award (YFRA) by IIT Madras, Chennai, September 2010. Awarded INSA Medal for Young Scientist by Indian National Science Academy, New Delhi, India, April 2008. Junior and Senior Research Fellow of Council for Scientific and Industrial Research, New Delhi, India, Aug. 1996-July 2001. Qualified Graduate Aptitude Test in Engineering, All India Rank-1, March 1996. Winner of the Gold Medal at the Chemistry Aptitude Test held by the Indian Chemical Society, March 1995. 17th Rank in the Merit List of the S.S.C. Board Examination Held by Maharashtra Board, July 1989. In the broad area of Organic Chemistry, the main focus of Prof. Gharpure's research has been the development of new synthentic methods, which would be applicable for the synthesis of natural and unnatural products of biological relevance. We have used vinylogous functional groups, namely vinylogous carbonate and carbamate, in the stereoselective synthesis of oxa- and aza-cycles. The reactivity of vinylogous carbonates/carbamates was studied under a variety of conditions. Thus, our group has used radical cyclisation to vinylogous carbonates/carbamates for the stereoselective synthesis of new oxa-cages as well as angular oxa- and aza-triquinanes. An efficient strategy for the synthesis of tetrahydrofurans (THFs), tetrahydropyrans (THPs) and oxepane derivatives has been developed employing a tandem SN2-Michael addition to vinylogous carbonates. On the other hand, intramolecular cyclopropanation of vinylogous carbonates/carbamates using carbenes led to the oxygen and nitrogen bearing donor-acceptor substituted cyclopropanes (DACs). 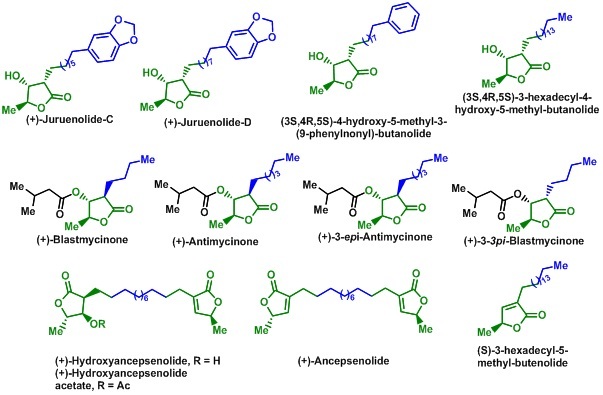 These DACs could be converted into diversely functionalized THFs, THPs, lactones, pyrrolidine, piperidine and lactam derivatives, which is again explored for the total synthesis of bioactive molecules such as butanolide and butenolide based natural products.Vinylogous carbonates/carbamates were also found to give useful reactions in the presence of Lewis acids undergoing intramolecular Pictet-Spengler as well as Prins type cyclizations leading to N-fused oxazinoindoles, dihydrobenzofurans and dihydroindole derivatives. Apart from using vinylogous functional groups in the synthesis of oxa- and aza-cycles, our group has developed efficient strategies for the synthesis of flavans and isoflavans. Flavans and isoflavans are class of compounds, which are thought to be responsible for biological activity of traditional Chinese medicines. The strategy relying on o-quinone methides has been used for the total synthesis of variety of natural products of this family like equol, 3'-hydroxyequol, vestitol and myristinins. 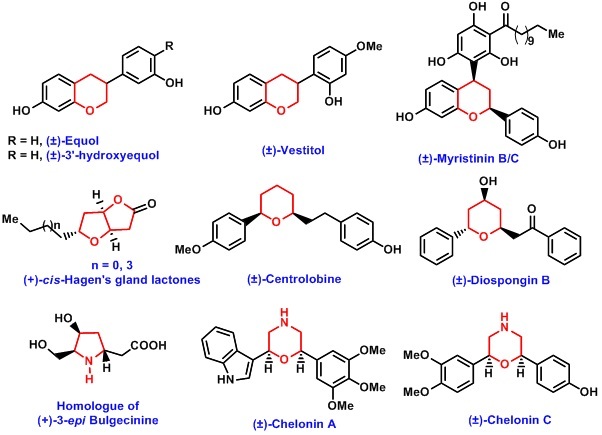 Very recently, we have also developed stereoselective strategies for construction of morpholines and oxazepenes, which are important pharmacophores.This method also used for the total synthesis of chelonin A and Chelonin C.
"Shortest Route to Mucocin", C & E News2003, 81(49), 32. 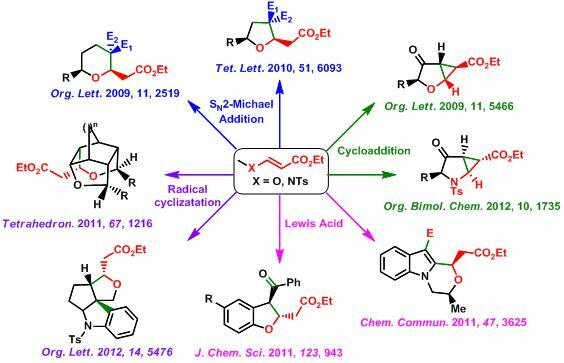 "Synthesis of Heterocyclic Triquinanes via Sequential Radical Cyclizations", Victor Snieckus and Nathan E. Genung (Pfizer), Synfacts2013, 9, 33. "Young Career Focus: Dr. Santosh J. Gharpure (Indian Institute of Technology Bombay, Mumbai, India)", Synstories, SYNFORM, 2014/03, Published online: 17.02.2014, DOI: 10.1055/s-0033-1340792. 48. Counter Ion Dependent Alkyne Iminium Ion Cyclization for Divergent Synthesis of N-Fused Indolylidine, Indole and Indoline Derivatives Promoted by the Lewis/Bronsted Acid. S. J. Gharpure, Y. G. Shelke and D. P. Kumar, Org. Lett. accepted. 47. Stereoselective Synthesis of cis-2,6-DisubstitutedMorpholines and 1,4-Oxathianes by Intramolecular Reductive Etherification of 1,5-Diketones. S. J.Gharpure, D. Anuradha, J. V. K Prasad, and P. S. Rao, Eur. J. Org. Chem., 2015, 86-90. 46.Donor-Acceptor Substituted Cyclopropane to Butanolide and Butenolide Natural Products: Enantiospecific First Total Synthesis of (+)-Hydroxyancepsenolide. S. J. Gharpure, Laxmi Narayan Nanda and M. K. Sukla, Org. Lett.2014,16, 6424?6427. 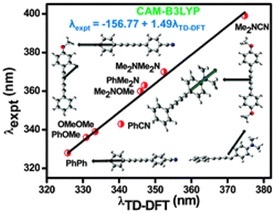 45.On the Photophysics of ButadiyneBridged Pyrene-Phenyl Molecular Conjugates: Multiple Emissive Pathways Through Locally Excited, Intramolecular Charge Transfer and ExcimerStates. 44.Synthesis of IsochromeneDerivatives using an Intramolecular Benzylic C(sp3)-C(sp2) Bond Forming Heck Reaction on Vinylogous Carbonates. S.J. Gharpure ,Yogesh, G. Shelke and S.R.B. Reddy,RSC Adv.,2014, 4, 46962-46965. 43. Stereoselective Synthesis of C-fused Pyranoindoles, Pyranobenzofurans and PyranobenzothiopheneScaffolds using Oxa-Pictet-Spengler Type Teaction of Vinylogous Carbonates. S. J. Gharpure and V. Prasath,Org. Biomol. Chem., 2014,12, 7397-7409. 42.Substituted DiphenylButadiynes: a Computational Study of Geometries and Electronic Transitions using DFT/TD-DFT. A. K.Pati, S. J. Gharpure and A. K. Mishra, Phys. Chem. Chem. Phys.,2014, 16, 14015-14028. 41.Tandem Nucleophilic Addition/Oxa-Michael Reaction for the Synthesis of cis-2,6-DisubstitutedTetrahydropyrans. S. J. Gharpure, J. V. K. Prasad and KalisankarBera,Eur. J. Org. Chem., 2014,3570-3574. 40. Stereoselective Synthesis of Oxa-Bowls by Nucleophilic Addition to Oxonium Ions: Observation of Nucleophile-Dependent Hydride Migration. S. J. Gharpure and S. K. Porwal, Eur. J. Org. Chem., 2013, 7277-7281. 39. 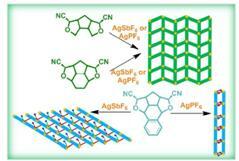 Coordination Polymers via Self-assembly of Silver(I) and cis-Bisnitrile-oxa-bowl Derivatives. P. Niranjana, A. Pati, S. K. Porwal, V. Ramkumar, S. J. Gharpure and D. K. Chand, CrystEngComm.,2013.15, 9623-9633. 38. Hetero Diels-Alder Reaction of Olefin with o-Quinone Methides Generated Using (±) Binolphosphoric Acid for the Stereoselective Synthesis of 2,4-Diarylbenzopyrans: Application to the Formal Synthesis of Myristinin B/C. S. J. Gharpure, A. M. Sathiyanarayananand P. K. Vuram, RSC Adv., 2013,3, 18279-18282. 37. Deciphering the Photophysical Role of Conjugated Diyne in Butadiynyl Fluorophores: Synthesis, Photophysical and Theoretical Study. A. K. Pati, M. Mohapatra, P. Ghosh, S. J. Gharpure and A. K. Mishra, Phys. Chem. A.,2013, 117, 6548-6560. 36. Stereoselective synthesis of benzoxepines using tandem alkylation-Michael addition to vinylogous carbonates. S. J. Gharpure and S. R. B. Reddy, Eur. J. Org. Chem., 2013, 2031-2038. 35. Stereoselective Synthesis of Substituted 1,4-Oxazepanes by Intramolecular Reductive Etherification. S. J. Gharpure and J. V. K. Prasad, Eur. J. Org. Chem., 2013, 2076-2079. 34. Synthesis of Oxa-, Aza- and Thia-Bowls and Cages. S. J. Gharpure and S. K. Powal, Org. Prep. Proc. Int., 2013, 45, 81. (Invited review). 33. Stereoselective Synthesis of Oxa- and Aza-Angular Triquinanes Using Tandem Radical Cyclization to Vinylogous Carbonates and Carbamates. S. J. Gharpure, P. Niranjana and S. K. Powal, Org. Lett., 2012, 14, 5476. (Highlighted in Synfacts, 2013, 9(1), 0033). 32. Stereoselective Synthesis and Applications of Nitrogen Substituted Donor-Acceptor Cyclopropanes (N-DACs) in the Divergent Synthesis of Azacycles. S. J. Gharpure, U. Vijayasree and S. R. B. Reddy, Org. Biomol. Chem., 2012, 10, 1735. 31. Stereoselective Synthesis of C-Substituted Morpholine Derivatives using Reductive Etherification Reaction: Total Synthesis of Chelonin C.
S. J. Gharpure and J. V. K. Prasad, J. Org. Chem., 2011, 76, 10325 . 30. Enantioselective Total Synthesis of (+)-Hagen's Gland Lactones. S. J. Gharpure, L. N. Nanda, and M. K. Shukla, Eur. J. Org. Chem., 2011, 6632. (Among the top 10 most downloaded paper for October 2011). 29. Stereoselective Synthesis of 2,3-Disubstituted Dihydrobenzofuran using Alkyne Prins Type Cyclization to Vinylogous Carbonates. S. J. Gharpure, V. Prasath, J. Chem. Sci., 2011, 123, 943. (invited article - International Year of Chemistry) . 28. Stereoselective synthesis of oxazino[4,3-a]indoles employing oxa-Pictet-Spengler reaction of indoles bearing N-tethered vinylogous carbonate. S. J. Gharpure, A. M. Sathiyanarayanan, Chem. Commun., 2011, 47, 3625. 27. Alkyl radical cyclization to vinylogous carbonates for the stereoselective synthesis of unsymmetrical dioxa-cage compounds: Effect of conformation on the rate of cyclization v/s reduction. S. J. Gharpure, S. K. Porwal, Tetrahedron, 2011, 67, 1216 . 26. Tandem SN2-Michael Addition to Vinylogous Carbonates for the Stereoselective Construction of 2,3,3,5-Tetrasubstituted Tetrahydrofurans. S. J. Gharpure, S. R. B. Reddy, Tetrahedron Lett., 2010, 51, 6093. 25. Tandem Radical Cyclization Based Strategy for the Synthesis of Oxa- and Aza-Cages: A Case of Fragmentation v/s Cyclization. S. J. Gharpure, S. K. Porwal, Tetrahedron Lett., 2010, 51, 3324 . 24. Stereoselective Synthesis of Donor-Acceptor Substituted Cyclopropafuranones by Intramolecular Cyclopropanation of Vinylogous Carbonates: Divergent Synthesis of Tetrahydrofuran-3-one, Tetrahydropyran-3-one and Lactones. S. J. Gharpure, M. K. Shukla, U. Vijayasree Org. Lett., 2009, 11, 5466. 23. Topologically Driven Tandem Radical Cyclization Based Strategy for the Synthesis of Oxa and Aza-Cages. S. J. Gharpure, S. K. Porwal, Tetrahedron Lett., 2009, 50, 7162 . 22. 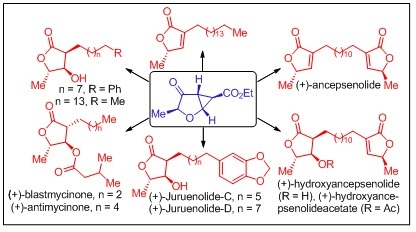 Tandem Alkylation-Michael Addition to Vinylogous Carbonates for the Stereoselective Construction of 2,3,3,6-Tetrasubstituted Tetrahydropyrans. S. J. Gharpure, S. R. B. Reddy, Org. Lett., 2009, 11, 2519. 21. o-Quinone Methide Based Approach to Isoflavans: Application to the Total Syntheses of Equol, 3'-Hydroxyequol and Vestitol. S. J. Gharpure, A. M. Sathiyanarayanan, P. Jonnalagadda, Tetrahedron Lett., 2008, 49, 2974. 20. Stereoselective Synthesis of New Oxa-Cages via Alkyl Radical Cyclization to Vinylogous Carbonates. S. J. Gharpure, S. K. Porwal, Synlett, 2008, 242 . 19. Stereoselective Synthesis of 1,2,2-Trisubstituted Indane Derivatives Using Tandem SN2-Michael Addition Sequence. S. J. Gharpure, S. R. B. Reddy, U. Sanyal, Synlett, 2007, 1889 . 18. An Enantiospecific Strategy to All Four Diastereomers of A-Ring Enyne Synthon of 1 ,25- Dihydroxyvitamin D3. A. Srikrishna, S. J. Gharpure, P. P. Kumar, Ind. J. Chem. B 2006, 45B, 2736. 17 An Enantiospecific Synthesis of 2-Pupukeanone. A. Srikrishna, P. R. Kumar, S. J. Gharpure, Ind. J. Chem. B 2006, 45B, 1909. 16. A Central Strategy for Converting Natural Products into Fluorescent Probes. M. D. Alexander, M. D. Burkart, M. S. Leonard, P. Portonovo, B. Liang, X. Ding, M. M. Joulli, B. M. Gulledge, J. B. Aggen, A. R. Chamberlin, J. Sandler, W. Fenical, J. Cui, S. J. Gharpure, A. Polosukhin, H.-R. Zhang, P. A. Evans, A. D. Richardson, M. K. Harper, C. M. Ireland, B. G. Vong, T. P. Brady, E. A. Theodorakis, J. J. La Clair, Chem. Bio. Chem. 2006, 7, 409. 15. Enantiospecific Synthesis of (+)-2-Thiocyanatoneopupukeanane. A. Srikrishna, S. J. Gharpure, Proc. of AP Akademi of Sciences 2005, 9, 115. 14. Enantioselective Total Synthesis of the Potent Antitumor Agent (-)-Mucocin using a Temporary Silicon-Tethered (TST) Ring-Closing Metathesis (RCM) Cross-Coupling Reaction. P. A. Evans, J. Cui, S. J. Gharpure, A. Polosukhin, H. -R. Zhang, J. Am. Chem. Soc. 2003, 125, 14702. 13. Stereoselective Construction of cis-2,6-Disubstituted Tetrahydropyrans via the Reductive Etherification of ?-Trialkylsilyloxy Substituted Ketones: Total Synthesis of (-)-Centrolobine. P. A. Evans, J. Cui, S. J. Gharpure, Org. Lett. 2003, 5, 3883. 12. Stereoselective Construction of Cyclic Ethers using a Tandem Two-Component Etherification: Elucidation of the Role of Bismuth Tribromide. P. A. Evans, J. Cui, S. J. Gharpure, R. J. Hinkle, J. Am. Chem. Soc. 2003, 125, 11456. 11. Stereochemistry of the Marine Sesquiterpene 2-Thiocyanatoneopupukeanane: Crystal Structure of Neopupukean-2-yl 4-nitrobenzoate. A. Srikrishna, S. J. Gharpure, P. Venugopalan, Ind. J. Chem. B 2003, 42B, 129. 10. Chiral Synthons from Carvone. Part 56. Enantiospecific Synthesis of (-)-4-Thiocyanatoneopupukeanane. A. Srikrishna, S. J. Gharpure, ARKIVOC 2002, 7, 52. 9. A Ring Closing Metathesis Based Approach for the Spiroannulation of Cyclopentanes and Cyclohexanes. Formal Synthesis of (±)-Acorones. A. Srikrishna, M. S. Rao, S. J. Gharpure, N. C. Babu, Synlett 2001, 1986. 8. Enantiospecific Synthesis of B-seco-C-Aromatic Taxanes. A. Srikrishna, T. J. Reddy, P. P. Kumar, S. J. Gharpure, Ind. J. Chem. B 2001, 40B, 905. 7. Enantiospecific Total Synthesis of (-)-4-Thiocyanatoneopupukeanane. A. Srikrishna, S. J. Gharpure, J. Org. Chem. 2001, 66, 4379. 6. 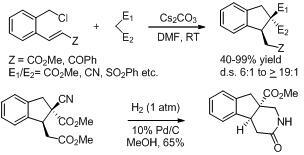 An Enantiospecific Synthesis of (-)-2-Pupukeanone via a Rhodium Carbenoid C-H Insertion Reaction. A. Srikrishna, P. R. Kumar, S. J. Gharpure, Tetrahedron Lett. 2001, 42, 3929. 5. 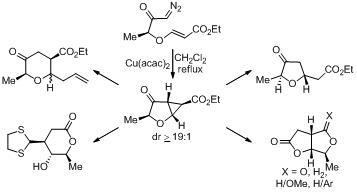 Novel Formation of Chloromethanesulfinates in the Methanesulfonylation Reaction of Hindered Alcohols. A. Srikrishna, S. J. Gharpure, Synlett 2000, 1354. 4. Enantiospecific Total Synthesis of both Enantiomers of 2-Thiocyanatoneopupukeanane from (R)-Carvone. A. Srikrishna, S. J. Gharpure, J. Chem. Soc. Perkin Trans. 1 2000, 3191. 3. A Simple, Enantiospecific Approach to both Enantiomers of 1?,25-Dihydroxyvitamin D-3 A-Ring Precursors from (R)-Carvone. A. Srikrishna, S. J. Gharpure, P. P. Kumar, Tetrahedron Lett. 2000, 41, 3177. 2. Enantiospecific First Total Synthesis of (-)-4-Thiocyanatoneopupukeanane. A. Srikrishna, S. J. Gharpure, Tetrahedron Lett. 1999, 40, 1035. 1. An Intramolecular Rhodium Carbenoid C-H Insertion Approach to Chiral Isotwistanes. Synthesis of (-)-Neopupukean-4,10-dione and (-)-Neopupukean-10-one. A. Srikrishna, S. J. Gharpure, Chem. Commun. 1998, 1589.